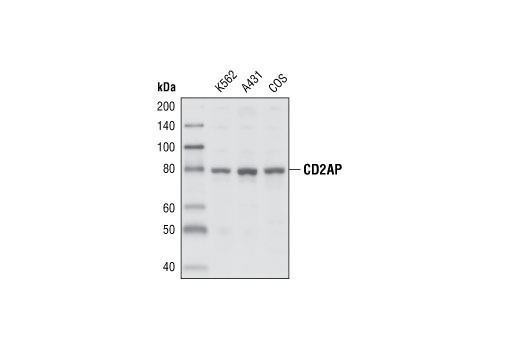 Western blot analysis of extracts of K562, A431 and COS cells, using CD2AP Antibody. Western blot analysis of extracts from A431 and MCF7 cells using Claudin-1 (D5H1D) XP® Rabbit mAb (upper) or β-Actin (D6A8) Rabbit mAb #8457 (lower). Western blot analysis of extracts from various cell lines using ZO-1 (D7D12) Rabbit mAb. 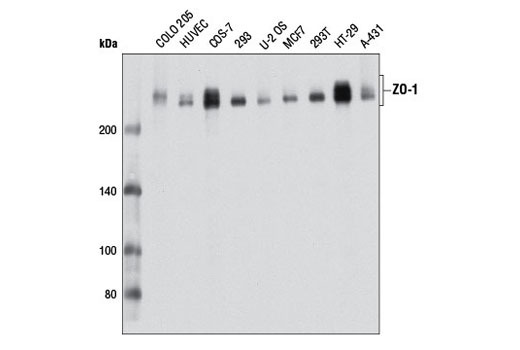 Western blot analysis of extracts from various cell types using ZO-2 Antibody. 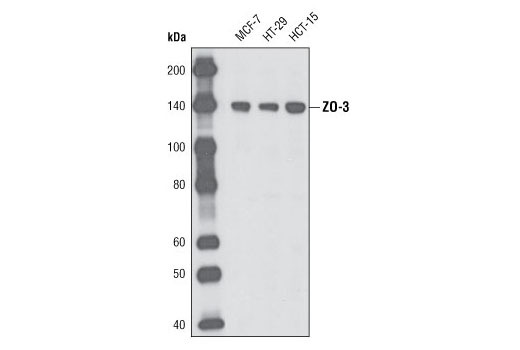 Western blot analysis of extracts from MCF-7, HT-29 and HCT-15 cells using ZO-3 (D57G7) XP® Rabbit mAb. Western blot analysis of extracts from various cell lines using Afadin (D1Y3Z) Rabbit mAb. Immunoprecipitation of claudin-1 from A-431 cell extracts using Rabbit (DA1E) mAb IgG XP® Isotype Control #3900 (lane 2) or Claudin-1 (D5H1D) XP® Rabbit mAb (lane 3). Lane 1 is 10% input. 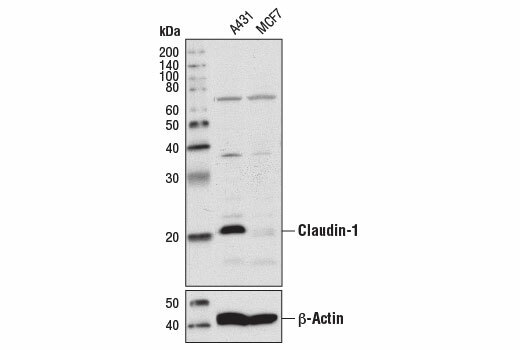 Western blot was performed using Claudin-1 (D5H1D) Rabbit mAb. Immunoprecipitation and western blot analysis of extracts from Hep G2 cells using ZO-1 (D7D12) Rabbit mAb. Lane 1 is 10% input. Confocal immunofluorescent analysis of A431 cells using ZO-2 Antibody (green). Actin filaments have been labeled with DY-554 phalloidin (red). Blue pseudocolor = DRAQ5™ (fluorescent DNA dye). Confocal immunofluorescent analysis of MCF-7 cells using ZO-3 (D57G7) XP® Rabbit mAb (green). Blue pseudocolor = DRAQ5® #4084 (fluorescent DNA dye). Immunoprecipitation of afadin from A-431 cell extracts using Rabbit (DA1E) mAb IgG XP® Isotype Control #3900 (lane 2) or Afadin (D1Y3Z) Rabbit mAb (lane 3). Lane 1 is 10% input. 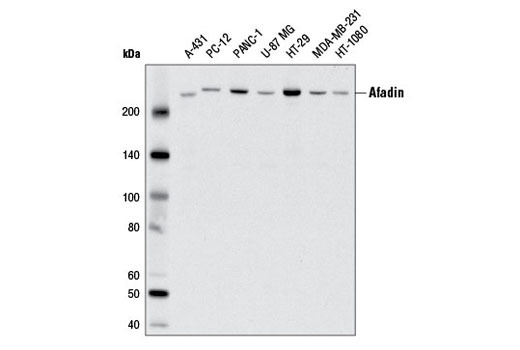 Western blot was performed using Afadin (D1Y3Z) Rabbit mAb. 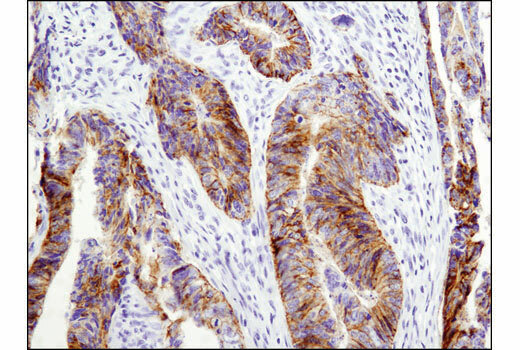 Immunohistochemical analysis of paraffin-embedded human colon carcinoma using Claudin-1 (D5H1D) XP® Rabbit mAb. 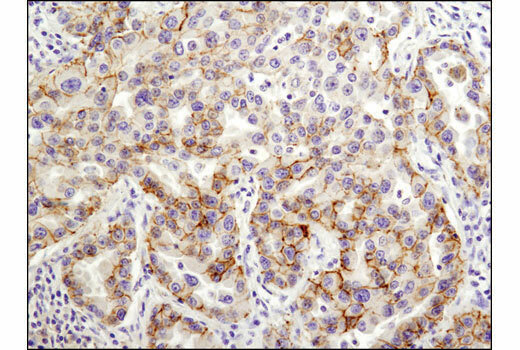 Immunohistochemical analysis of paraffin-embedded human lung carcinoma using Claudin-1 (D5H1D) XP® Rabbit mAb. Immunohistochemical analysis of paraffin-embedded cell pellets, A-431 (left) and MCF7 (right), using Claudin-1 (D5H1D) XP® Rabbit mAb. 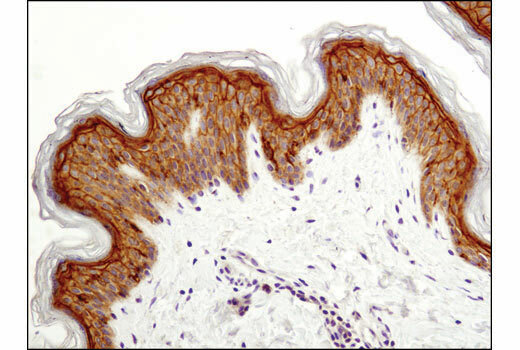 Immunohistochemical analysis of paraffin-embedded human skin using Claudin-1 (D5H1D) XP® Rabbit mAb. 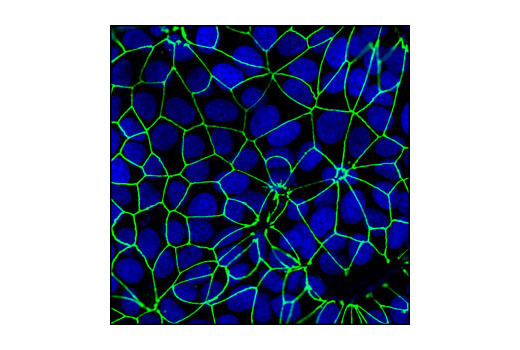 The Tight Junction Antibody Sampler Kit provides an economical means to evaluate the presence of a number of proteins involved in tight junctions. The kit contains enough primary antibodies to perform two western blot experiments per primary antibody. CD2AP Antibody recognizes endogenous levels of total CD2AP protein. 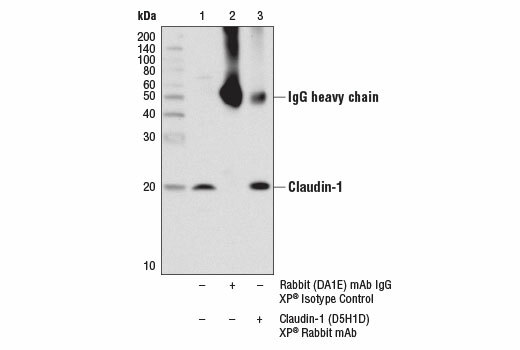 Claudin-1 (D5H1D) XP® Rabbit mAb recognizes endogenous levels of total claudin-1 protein. 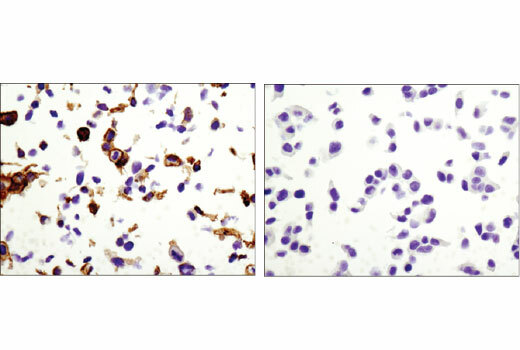 Based on sequence similarity, Claudin-1 (D5H1D) XP® Rabbit mAb may cross-react with claudin-2 protein. ZO-1 (D7D12) Rabbit mAb recognizes endogenous levels of total ZO-1 protein. 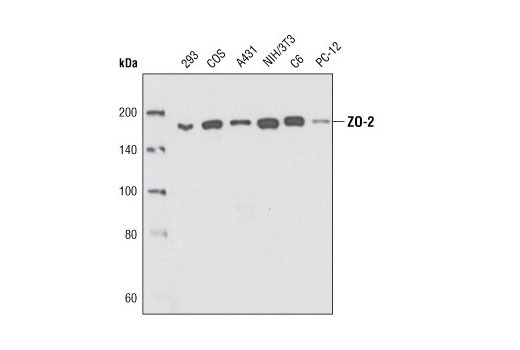 ZO-2 Antibody recognizes endogenous levels of total ZO-2 protein. 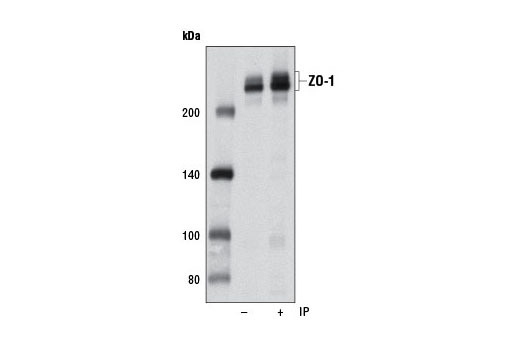 ZO-3 (D57G7) XP® Rabbit mAb detects endogenous levels of total ZO-3 protein. 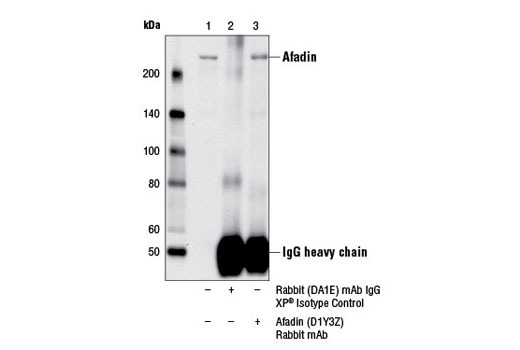 Afadin (D1Y3Z) Rabbit mAb recognizes endogenous levels of total afadin protein and based on the protein sequence, this antibody is expected to recognize all afadin isoforms. Polyclonal antibodies are produced by immunizing animals with a synthetic peptide corresponding to residues surrounding the carboxy terminus of human γ-catenin protein or the sequence of human catenin δ-1 protein. Polyclonal antibodies are purified by protein A and peptide affinity chromatography. Monoclonal antibody is produced by immunizing animals with a synthetic peptide corresponding to the amino-terminal sequence of human α-E-catenin, the carboxy terminus of human claudin-1 protein, Arg1117 of human afadin protein or to residues surrounding Pro714 of human β-catenin protein. Tight junctions, or zona occludens, form a continuous barrier to fluids across the epithelium and endothelium. They function in regulation of paracellular permeability and in the maintenance of cell polarity, blocking the movement of transmembrane proteins between the apical and basolateral cell surfaces (reviewed in 1). Tight junctions are composed of claudin and occludin transmembrane proteins, which join the junctions to the cytoskeleton (1,2). 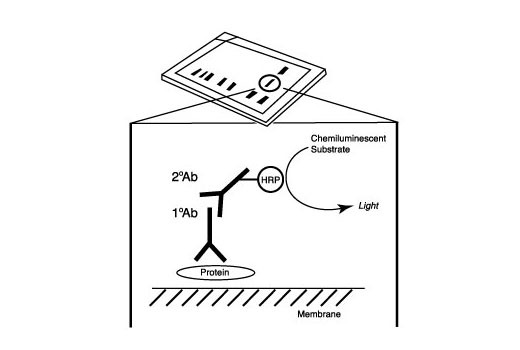 The claudin family is composed of 23 integral membrane proteins, and their expression, which varies among tissue types, may determine both the strength and properties of the epithelial barrier (2,3). Zona occludens proteins ZO-1, -2, and -3 (also known as TJP1, 2, and 3) are peripheral membrane adaptor proteins that link junctional transmembrane proteins such as occludin and claudin to the actin cytoskeleton (reviewed in 4). ZO-1 and ZO-2 are required for tight junction formation and function (5,6). In subconfluent proliferating cells, ZO-1 and ZO-2 have been shown to colocalize to the nucleus and play a role in transcriptional regulation (7-9). Exogenous expression of the amino terminal portion of ZO-3 exerts a dominant negative effect that interferes with assembly of tight junctions and adherens junctions (10). ZO-1 has been shown to interact with afadin prior to the formation of tight junctions (11). Recent work has also shown that afadin is involved in controlling the directionality of cell movement when it is localized at the leading edge of moving cells (12,13). CD2AP is a scaffolding protein that is thought to link membrane proteins to the cytoskeleton (14-16). It plays a role in the formation of tight junctions in specialized cell types such as the slit diaphragm of the kidney glomerulus (17). CD2AP is also involved in the immunological synapse between CD2-expressing T cells and antigen presenting cells (18). Research studies have shown that interaction between CD2AP and other cytoskeletal proteins may regulate the endocytosis of EGFR (16). Hewitt, K.J. et al. (2006) BMC Cancer 6, 186. Betanzos, A. et al. (2004) Exp Cell Res 292, 51-66. Oliveira, S.S. and Morgado-Díaz, J.A. (2007) Cell Mol Life Sci 64, 17-28. Traweger, A. et al. (2003) J Biol Chem 278, 2692-700. Matter, K. and Balda, M.S. (2007) J Cell Sci 120, 1505-11. Huerta, M. et al. 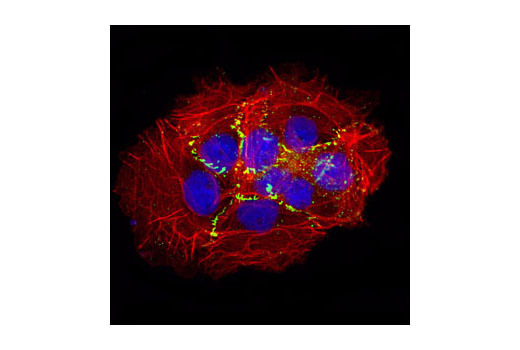 (2007) Mol Biol Cell 18, 4826-36. Hernandez, S. et al. (2007) Exp Cell Res 313, 1533-47. Wittchen, E.S. et al. (2000) J Cell Biol 151, 825-36. Umeda, K. et al. (2006) Cell 126, 741-54. Ooshio, T. et al. (2010) J Biol Chem 285, 5003-12. Kirsch, K.H. et al. (1999) Proc Natl Acad Sci U S A 96, 6211-6. Kirsch, K.H. et al. (2001) J Biol Chem 276, 4957-63. Lynch, D.K. et al. (2003) J Biol Chem 278, 21805-13. Kawachi, H. et al. (2006) Nephrology (Carlton) 11, 274-81. Hutchings, N.J. et al. (2003) J Biol Chem 278, 22396-403.